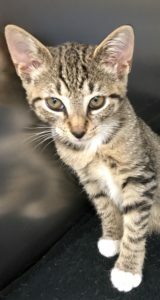 Jules is a beautiful tabby female, born on August 7, 2018. She was rescued from Middle Island. Come meet this lovely girl! This entry was posted in Cats, Female, Under 6 Months, Wantagh Adoption Center. Bookmark the permalink.